Temperatures are looking good out there which means families and friends are heading outdoors. Whether its a party, a barbeque or as simple as a get together your fire pit may need a small upgrade. Glaz Chips Fire Glass has a clean, modern and vibrant solution for you with affordable fire glass for fire pits. So why fire glass? Well to start off its by far a cleaner product and doesn’t leave an entire mess like logs or lava rocks. Notably our fire glass products are easy to maintain. Its as simple as a rinsing with water, letting it air dry and back into your fireplace. You can’t say the same with logs or lava rocks. With our various color selections you have choices before you buy. You can go with whatever color palette you’d like. Interested in earth tone colors or perhaps an aqua toned color that will give your backyard an extra contrast? We have several colors ranging from bronze to vibrant blues to help you in your selection process. 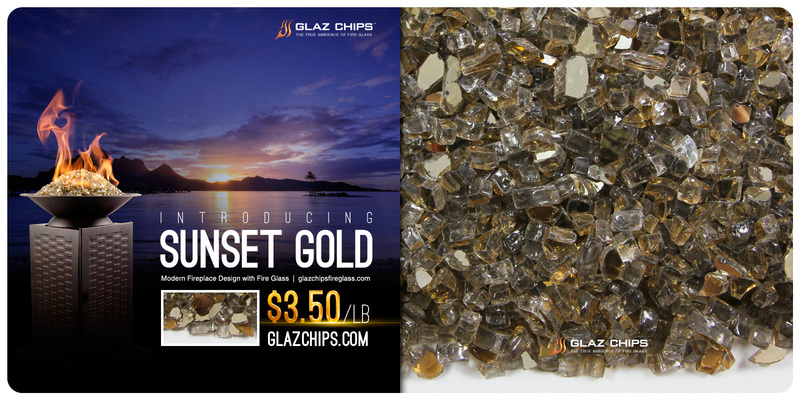 To start off April, Glaz Chips Fire Glass is putting its premium Sunset Gold Fire Glass on SPECIAL at $3.50 /lb (orig $6.95 /lb). Having trouble deciding how much you’ll need? Just surf on over to our fireplace glass calculator to give you an idea of how much you need. Make sure to scroll up and down as we have fireplace diagrams ranging from rectangular and circular shaped fireplaces. Glaz Chips offers an affordable product that was once thought impossible to purchase. To make it even more affordable we’re putting our best fire glass product out there with Sunset Gold. Start off spring or gear up for the summer by firing up your fireplace with fireglass and give yourself boasting rights when you have company over. Make sure and follow us on FACEBOOK + INSTAGRAM for news, features and sale coupons! Categories: backyard ideas, construction, decor, design, firepits, fireplaces, sale | Tags: construction, design, discount, diy, family, fire bowl, fire pits, fireglass, fireplace ideas, fireplaces, friends, glass for firepit, glass for fireplaces, home and hearth, home decor, home improvement, retail, sale, spring, summer | Permalink.